In the classic book The Hitchhiker’s Guide to the Galaxy, a creature called the Babel fish is able to translate any language instantaneously. 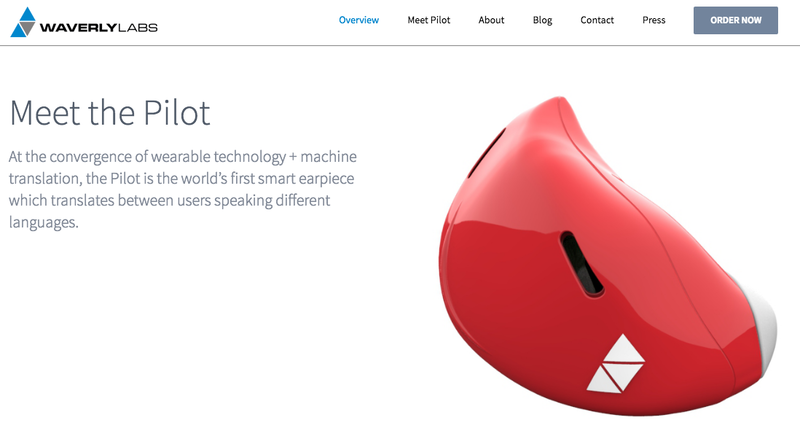 That ability may sound like it can belong only in a world of science fiction, but New York-based startup Waverly Labs is making it a reality with a groundbreaking piece of wearable tech called the Pilot. The Bluetooth-enabled device aims to provide real-time translations of multilingual conversations and create a world free of language barriers. The earpiece works by capturing the speaker’s voice and relaying it to the accompanying smartphone app for translation, which is then sent to the listener’s ear buds in their chosen language. European-based Romance and Germanic languages will be available initially. Next year the company hopes to start researching East Asian languages, such as Chinese, Korean and Japanese. In June, Waverly Labs completed a wildly successful Indiegogo campaign for the Pilot, raising more than $2.6 million USD to fund the project. The first earpieces are currently scheduled for delivery in mid-2017. Founder and CEO Andrew Ochoa shared with The Venture the inspiration behind the device and the impact he hopes the Pilot will have moving forward. Where did the idea for the Pilot come from? I was on vacation, and I met this girl. She spoke English, but not perfectly, and I didn't speak her language. We tried using an app on a phone to do some basic translation, but it was just missing that experience of being able to speak to each other without having this object or device in between us. At that time, my cofounders and I were inspired by wearable tech. We were already building a smart earpiece, but we didn’t know what the innovation was going to be. And then I had this experience, and I said, let’s build a translator earpiece. The Indiegogo campaign far surpassed its goal and was 3,175% funded. What did that tell you about the need for a wearable like the Pilot? We were working on this for two years, trying to figure out how to build it. Then when we built the prototype, the question for our team was, do we keep building this? We were funding this out of our own pocket, mostly. You think you're building something incredibly innovative, but you really don’t know if people want it unless you put it out there for them to see. That was the whole reason for launching our crowdfunding campaign. We had seen the initial success of just the promotional video that we put out on Facebook, which had some 45 million views in a two-week timespan. It went incredibly viral. It was overwhelming. And when we launched the official campaign on Indiegogo, we blew past a million in the first two and a half hours. We knew we had something people wanted, and that was exciting. What was the first conversation you had using the first working prototype? I think the very first time was just something simple- "How are you?" "How's the weather?" Getting to this first step is incredibly satisfying, but we still have work to do. There’s definitely more lag than we want. That makes it difficult to have a very fluid conversation. And it's not a perfect translation all the time. But it’ll get better with every iteration. It’s almost like we’re trying to build a flying car. We’re doing something that could have such a huge impact on society. Who do you imagine Pilot customers to be? We've had so much interest from all kinds of individuals and businesses and organizations. We’ve gotten emails from nonprofits in Greece that are working to help Syrian refugees, who have asked us to help them translate Arabic. We also have interest from a lot of travel and sports organizations. And we have consumer-use cases as well. We get emails from people who tell us, My wife's family is from so and so, and I don't speak their language; this will help me speak to my in-laws. So there are a lot of use cases we didn’t expect. What do you hope the Pilot’s overall impact will be in bridging language gaps around the world? Well, at the end of the day, we’re an innovation company. We have a lot of ideas for what the Pilot can do and what it can be, and what the company will become. What we know is, our society is becoming more globalized, and it’s only going to continue to be that way. I think the U.N. World Tourism Organization has said there will be 1.6 billion international trips every year by 2020. That's a lot of trips! But language barriers do hinder a lot travel and interaction, and we want to solve that problem. So that’s what the Pilot is right now, a translator. But in the long term, we want to open up the earpiece to be used in additional ways. The most important thing, though, is remembering to act natural because audiences connect with presenters whom they perceive as being authentic. “The number one key is to be yourself,” Fortescue says. The Venture is a global social enterprise initiative searching for extraordinary startups and new ideas that use business to create positive change. If you have a GCC-based social enterprise or an idea for a social enterprise, enter The Venture #WinTheRightWay to potentially win your share of US$1 million. Entries close on 30th November.